Empowering you and your agents with the right systems to resolve cases quickly and easily is what Service Cloud® is all about. 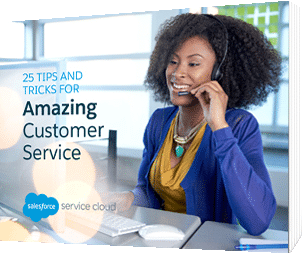 Connect with your customers in a whole new way and deliver outstanding customer service on every channel. Reach customers where they are, faster. Time is critical when talking about customer care. Faster support is more satisfying for the customer and saves your company money. Providing agents with the best tools to offer personalized and satisfying customer service benefits the whole service team. Give your customers the answers they need, whenever they need them. Provide personalized service that goes above and beyond what your competitors can deliver. Meet customers where they live with multichannel support, including phone and email, to social-media. We facilitate your Help Desk setup and help you create personalized and relevant engagements with your customers, all while gathering important customer information for your sales team. Whether your help desk is one person or spread out in multiple global contact centres, Nubik can help you make each and every customer feel valued. Our team of Salesforce experts will suggest the best solutions to improve every touchpoint in the customer service process. After thoroughly analysing your current process, we provide a detailed audit and summary. Then we provide workshops that will empower your service team and give them the necessary tools to execute their roles. Ultimately, we improve the experience for your customers, agents, and managers. As a services organisation, we understand what good customer service is all about. Being responsive, personalised and comprehensive. In addition to providing you with the best practices we’ve learned through our own experience and from our work with other organisations, we are pleased to help you leverage the full functionality of Salesforce Service Cloud so you can deliver the best service to your customers at every touchpoint. We have the business expertise backed by technical know-how to help companies to deliver the best customer service possible.